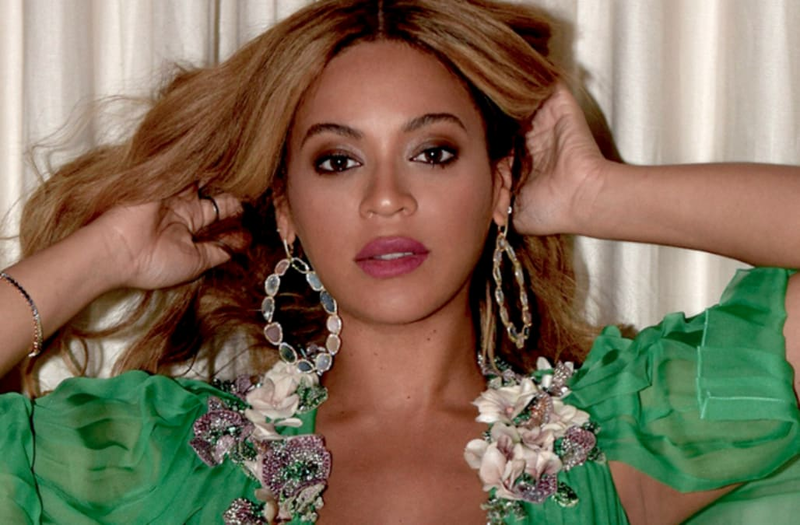 Beyoncé is gorgeous in green! The "Formation" singer, who's currently pregnant with twins, shared a bunch of photos on her website on Monday of her ensemble from last week's "Beauty and the Beast" premiere. Beyoncé hadn't walked the red carpet at the star-studded premiere, so the photos were the first direct look at her stunning look for the big event. She donned a plunging green gown that featured a belt right above her growing baby belly. The shoulders of the flowing dress were adorned with floral embellishments, and she paired the look with multi-colored hoop earrings. Also in the photos? Daughter Blue Ivy, who accompanied her mother to the premiere at El Capitan theater in Hollywood. The adorable 5-year-old matched her mom in a layered green party dress with a pink bottom. She was also rocking beaded braids and a high-wattage smile! Blue's father, Jay-Z, kept is casual in black slacks, white sneakers and an embroidered jean jacket. Though Beyoncé and family didn't walk the red carpet last week, plenty of other stars did. Celine Dion, Emma Watson, Aubrey Plaza and Matt Damon were just some of the major celebs who stepped out in support of Disney's live-action "Beauty and the Beast" remake.